In 1940, Thailand moved its New Year's Day from April 13th to January 1st. 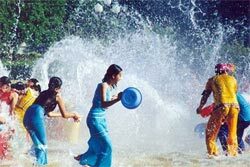 The old New Year is still a holiday called Songkran. Years are counted as the Buddhist era (B.E.) which started 543 years earlier than the Christian, era, therefore 2002 AD is the year 2545 BE. In Thailand there are three New Year's days. The Western, on Jan 1st, the Chinese New Year on the first day of the First Lunar month, usually in February and the Thai New Year marked by the Songkhran festival in April. Thais usually exchange gifts on January 1st. Held at the temple of the Holy Footprint at Saraburi, 236Km north of Bangkok, from 31st January to 1st February. Many activities including music and outdoor drama. Held in Chiang Mai during January, it features colourful paper umbrellas and other local handicrafts. 1st day of the first Chinese Lunar month, usually in February. Businesses close for 3-4 days giving families time to get together and worship at one of the Chinese Buddhist temples. There may also be public celebrations with acrobats, Lion Dance and firecrackers. The latter are believed to frighten away "foreign devils". 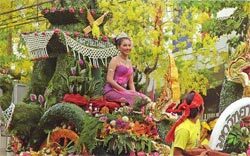 Held in Chiang Mai during February it features parades and colourful floats exhibiting the local flora. End of February/beginning of March, depending on the moon. This commemorates the day when 1250 of Buddha's disciples gathered spontaneously to hear him preach. Buddhists visit Wats and make merit by such acts as releasing caged birds. In the evening the celebrations culminate in a candle lit procession around the main temple building. Commemorates the founding of the Chakri Dynasty, of which the present King Bhumipon is the 9th King. Portraits of the King and Queen are prominently displayed and decked with tributes of flowers. This is the celebration of the old Thai New Year. Buddhists visit the temple for the ceremony of Rod Nam Dam Nua. They sprinkle water on the Buddha images, and on the hands of the monks and novices at the temple, as an offering to express confidence that the supply of water will be adequate to cover the dry season. Songkhran is a time when the Thai family will try to be together, and many people will travel back to their home village. This holiday has now become secularized, with exuberant merrymakers taking to the streets throwing water at each other, and you, by the cup full, the bucket full, or even with a hose. To add to the fun, talc is mixed with the water and may be daubed on your face. Take it all in good spirit, no one is exempt, not even the policemen. The cool water may even be a welcome relief as the festival coincides with the time when the sun is due overhead and the weather can be very hot. Held during the second week of April in Pattaya on Thailand's Eastern Seaboard. 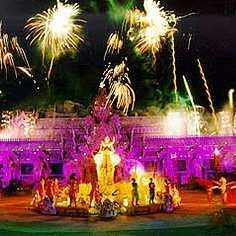 It features processions, floral displays, and other special events plus a spectacular fireworks display. This holiday follows the lead of many western countries, whose workers now celebrate Labour Day. This celebrates the coronation of the present King Bhumipon, Rama IX. Tributes are paid at shrines and portraits of His Majesty. This is an ancient Brahman ceremony, held under Royal patronage in Bangkok during May, which celebrates the beginning of the rice planting season. A festival is held in Rayong during May and another in Chantaburi during June. They feature locally grown fruit such as rambutan, durian, and jack fruit. Visakha Bucha Day - Full moon of the 6th Lunar Month. This celebrates the birth, death and enlightenment of Buddha, and is therefore the most sacred day on the Buddhist calendar. This is the day before the start of Buddhist Lent. Many young men, who are about to become monks, hold parties on this day. This marks the start of Khao Pansa, period similar to the Christian Lent. During the period monks do not travel to other monasteries, their religious duties are strictly observed, and the novice monks receive their training in the teachings of Buddha. Held in Ubon Ratchatani on Khao Pansa Day. Candles carved from bees wax are paraded through the streets. Tributes are paid to Her Majesty, and donations are made to the many charitable organisations that are patronised by the Queen. This commemorates the death of King Chulalongkorn, Rama V, who reigned between 1868 and 1910. He is renowned for his achievements in the fields of education, modernisation and progressive thinking. Held in Chonburi (80Km east of Bangkok) during October. The festival is believed to date back to the Sukhothai period, but its exact significance is uncertain. Krathongs, or lotus flowers made of natural materials, containing a candle, incense sticks, a coin or two and beautifully decorated with flowers are launched into the sea, or any convenient stretch of water, as a thanksgiving to the water spirits, and a cleansing of sins. A week long series of historical exhibitions, light and sound shows, and vintage train rides held in Kanchanaburi during the last week of October. Held during the third week of November at Surin in North East Thailand. Their Majesties the King and Queen preside over this annual event which is held in the Royal Plaza, Bangkok. People demonstrate their respect for King with flags, displays and other tributes. This marks the day in 1932, when the monarchy became constitutional, at the very beginning of democracy on Thailand. The end of the old year when everybody celebrates.